The dates for the next three Strategy Saturdays have been chosen. I'd been putting off confirming them until I knew what my schedule would be. As I had hoped Strategy Saturday will be back to its normal 2nd Saturday of the month pattern. Hopefully this change back to 'normal' isn't confusing. For April the Feature Game will be an older game that revises a yet older classic. 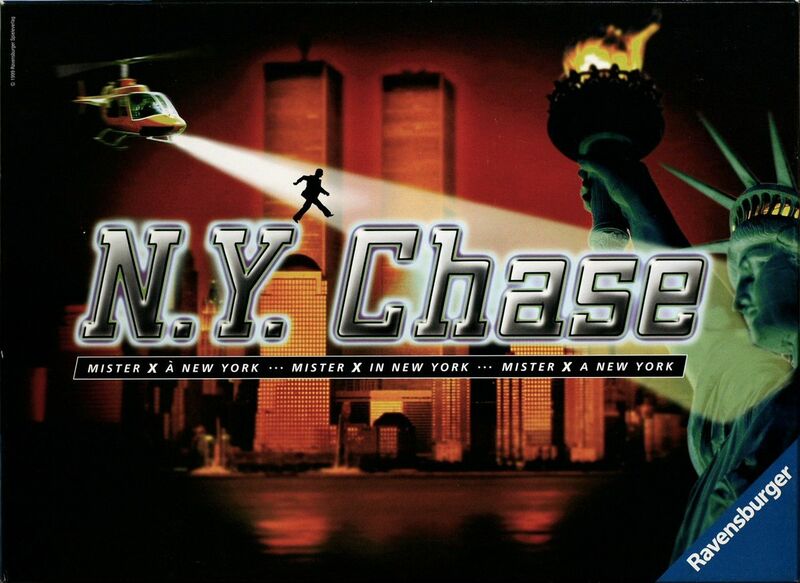 N.Y. Chase is Scotland Yard set in the streets of the lower Manhattan. Once again Mr. X must seek to elude the detectives and their now improved drag-net techniques. To put it more simply its a grand ol' game of hide-and-seek. !! !If you have a game you'd like to play and draw some attention to, feel free to volunteer for future Feature Game slots. Just drop me a note and I'll see if we can't get your game in the spotlight. Strategy Saturday will be at Argyle Road Baptist Church (3510 Argyle Rd) from 7pm to midnight. As usual we'll have our snack counter open so feel free to contribute a drink or something to munch on. And feel free to bring along friends (and to forward this invite). Accidentally posted in the wrong section. Please remove.